What do you think of this adorable Twins Diaper Cake? 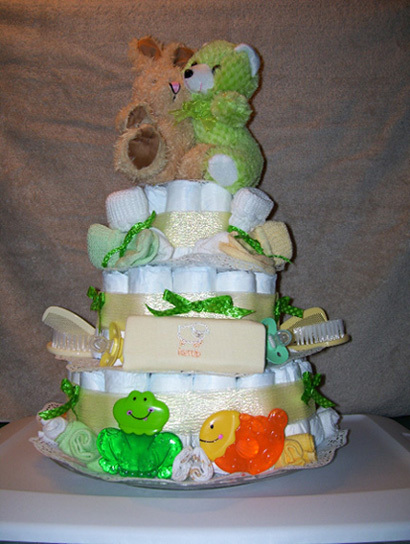 A diaper cake is SO helpful to any expectant mother with all the useful supplies that it comes with. So when having twins, a diaper cake is DOUBLY helpful!! And below you will find a picture of an adorable Twins diaper baby cake that one of our readers submitted. On behalf of everyone reading this, I want to thank Megan Howes from Minnesota for submitting this picture of her darling baby shower cake. What a cute cake, and I love the green & yellow! Megan is helping to make this website a better, more creative resource for all of us who are looking for some creative and cute baby shower ideas. Thank you Megan! We had bought all the supplies to make a diaper cake, but later to find out my brother and sister-in-law are now having twins. We then had to double the supplies. They have not and will not find out the sexes until the day of birth, so we chose to go with a yellow and green theme. Be creative and have fun! Thanks for sharing your beautiful cake, Megan! I am sure your sister-in-law will love it!! Want to learn how to make your own cake? Click here for easy-to-follow diaper cake instructions .